Prize 2 the Future – Here we come! It’s almost the end of the month, and we’ve been wildly distracted by the “Prize 2 The Future” contest which is soliciting proposals for a key piece of property in our downtown district. Nothing excites us more than an opportunity to facilitate progress in the city that we love! So for the time being, Bob’s paintbrush and our incredible and talented teammates have been devoted to creating a concept that will make something happen, or as it’s being promoted – “The Next Big Thing”! We’ve taken dozens of photographs, brainstormed lots of ideas, and toured not just this area, but the entire downtown, and we’re seeing everything once again through new eyes! UPDATE: HERE’S OUR COMPLETED PROJECT! But it’s not the first time we’ve gotten excited about Birmingham! 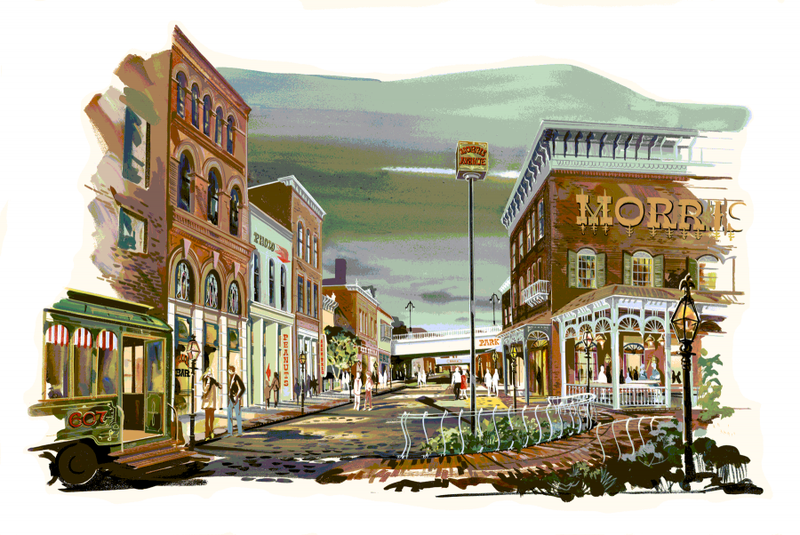 Bob decided many years ago that Morris Avenue had promise. 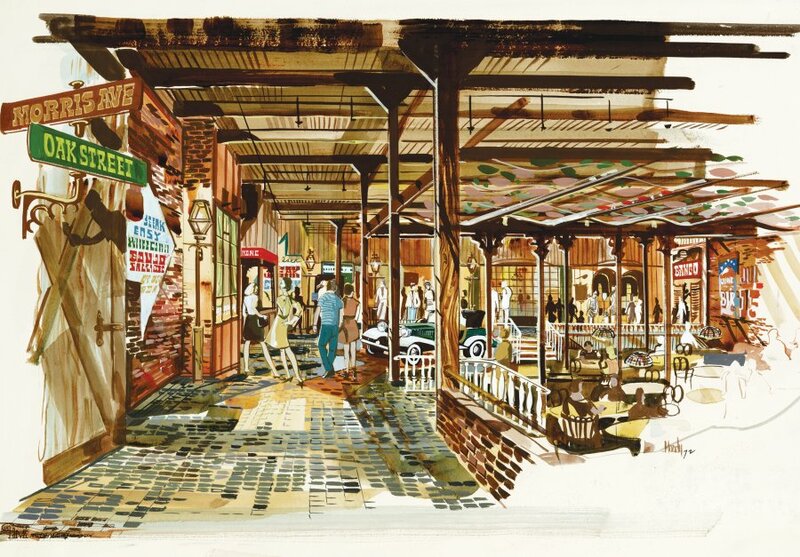 So on his own time, he proceeded to create a concept, painted renderings (including those below), created enthusiasm among the merchants and landlords, convinced the city to contribute funds for lighting and paving, and sold the landowners on varied tenants and cooperation. He even created a newspaper to market the area. And with the help of legislation written by State Legislator Richard Dominick, it became the first historic district in the State of Alabama. An artist CAN create a lot of buzz! 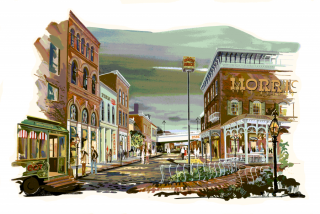 And although it hasn’t remained the entertainment district that Bob envisioned, the warehouse district complementing the railroad tracks has been preserved to live again! Five Points South featured the “Little Bomber” bar on the circle when we moved our offices there in the mid-70’s. 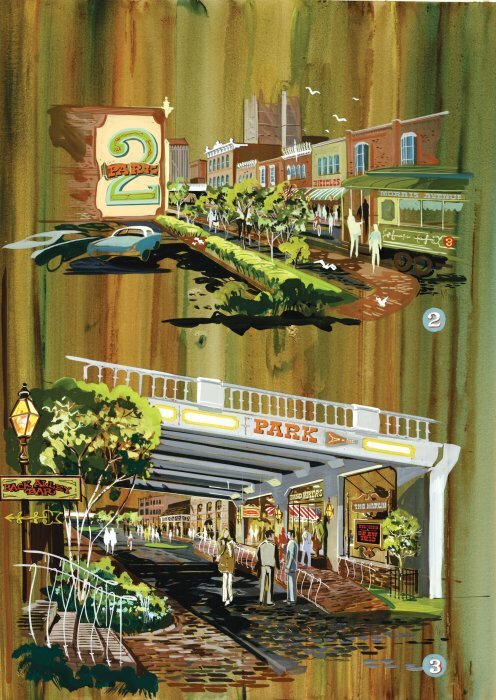 But with the help of some conceptual renderings by Bob, Mayor Richard Arrington along with ONB and the neighborhood association began to once again take an interest in the area. With private investment, we were able to transform the area into an exciting destination, signing a lease with a very young aspiring restauranteur named Frank Stitt. And we appreciated the support of a talented newly elected councilor named William Bell! For many years, we’ve thought that Birmingham was making steps toward a progressive future. But we’ve never been as optimistic as we are now. We’re seeing the downtown area make demands for amenities to serve the new loft residents. We’re seeing throngs of people with families and dogs enjoy the new Railroad Park. And we’ve seen entire communities rally via social media to protect their neighborhoods. Birmingham is changing, and changing fast! We believe this time Birmingham really is on the verge of something big! And we want to be a part of it! We can’t wait to see the concepts that are entered. Every single one will have validity and will contribute to the winning proposal. And all that energy that is being focused on our downtown HAS to be positive. So Bob is painting, and we are so pumped! Because win or lose, we believe in Birmingham, and we believe that this project will bust things WIDE OPEN! 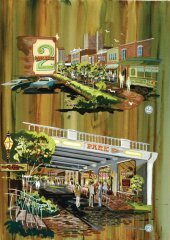 This entry was posted on Monday, January 31st, 2011 at 9:34 am	and is filed under Architectural Renderings, Artist Bio & Information, Birmingham Paintings, History. You can follow any responses to this entry through the RSS 2.0 feed. You can leave a response, or trackback from your own site. The Future is the Present. The transformation of one city block can be the catlyst for the future of Birmingham, our Region, and our State! Bob Moody is on the right track!